Not to be confused with Zoë Bell. Zoe Louise Ball (born 23 November 1970) is an English television and radio personality. She was the first female host of both The Radio 1 Breakfast Show and The Radio 2 Breakfast Show for the BBC, and presented the 1990s children's show Live & Kicking. Ball was a contestant in the third series of Strictly Come Dancing. Following this she replaced Claudia Winkleman in 2011 as host of the BBC Two spin-off show Strictly Come Dancing: It Takes Two. Ball also hosted the Strictly Come Dancing Live Tour in 2011 and 2015. In 2018, Ball was announced as the next Radio 2 Breakfast Show host and took over from Chris Evans in January 2019. Ball was born in Blackpool, Lancashire, and grew up in Farnham Common, Buckinghamshire. She attended Holy Cross Convent School in Chalfont St Peter, and also attended the Young Theatre at Beaconsfield where she trained as an actress. Her first TV appearance was as a child in the studio audience of the 1980s Saturday morning children's show, Saturday Superstore, on which her father, Johnny Ball, was appearing as a guest. Ball began her television career as a runner at Granada Television and researcher on BSkyB. She worked as a researcher for quiz shows for two years. Her presenting jobs have included hosting The Big Breakfast and The Priory on Channel 4, BBC One's Saturday morning children's programme Live & Kicking, and the pre-school programme Playdays. In 1994, Ball presented SMart with Mark Speight and Jay Burridge until she left in 1996. Between 1996 and 1998, she was a regular presenter on Top of the Pops, usually alternating with fellow presenters and DJs Jayne Middlemiss and Jo Whiley. Between 1999 and 2001, she was a co-host with Jamie Theakston on the Wednesday night chat/music show The Priory, which was commissioned by Chris Evans's then production company Ginger Productions. Ball co-hosted the 2002 BRIT Awards with Frank Skinner, following which motherhood meant that she took less television work. In 2005, she co-hosted the BBC reality show Strictly Dance Fever. In 2006, Ball co-hosted the ITV programme Extinct, alongside Trevor McDonald. In January 2007, she presented the second series of ITV's Soapstar Superstar, taking over from Fern Britton and Ben Shephard, who hosted the first series. In March 2007, she hosted the ITV talent search Grease Is the Word. Alongside Jamie Theakston, Ball presented Channel 5's quiz series Britain's Best Brain in 2009. Ball has guest presented several episodes of The One Show as a stand-in for Alex Jones. On 4 August 2013, as hostess of a special entitled Doctor Who Live: The Next Doctor, she revealed Peter Capaldi as the incoming Twelfth Doctor and hosted his first interview in that capacity. In November 2013, she co-hosted the BBC One Children in Need telethon, alongside Terry Wogan, Fearne Cotton, Nick Grimshaw and Tess Daly. In 2014, Ball presented a BBC Two spin-off from The Voice UK called The Voice: Louder on Two. The show aired for one series of ten episodes. In 2015, Ball hosted EastEnders: Backstage Live, a spin-off show during the EastEnders live week. She co-presented the BBC Young Dancer competition with Darcey Bussell on BBC Two. She also narrated two ITV Specials, The Nation's Favourite '70s Number One and The Nation's Favourite '80s Number One as well as the BBC One series Don't Tell the Bride. In 2016, Ball co-presented Can't Touch This, a Saturday night game show for BBC One, alongside Ashley Banjo. She also narrated The Nation's Favourite Carpenters Song. She guest-presented an episode of Film 2016. Since 2017, Ball has co-presented The Big Family Cooking Showdown with Nadiya Hussain on BBC Two. In October 2005, Ball became a contestant on the third series of the BBC One talent show Strictly Come Dancing, where she was partnered by Ian Waite. Ball and Waite were ranked in third place; they also scored 38/40 (including two tens) for three dances in the series and one in the Christmas special. In 2011, she took over from Claudia Winkleman as the host of Strictly Come Dancing's sister show It Takes Two, airing every weeknight on BBC Two; in 2014, whilst Winkleman was on leave after her daughter suffered serious burn injuries, Ball co-hosted the main show. In July 2017, her salary as a BBC presenter, for the financial year 2016–2017, was revealed to be between £250,000 and £299,999. Although known primarily for her TV work, Ball first worked in radio, after she became co-host of The Radio 1 Breakfast Show on BBC Radio 1 in October 1997 with Kevin Greening. She became the sole host, the first female DJ to do so. At this time, her hard-drinking, hard-partying lifestyle contributed to the identification of the so-called "ladette culture" of the late 1990s. She was twice warned by the BBC for swearing on the radio. Ball left BBC Radio 1 in March 2000 to bring up a family. Her final show was on 10 March 2000, and she was succeeded by Sara Cox. Ball returned to radio in mid-2002 when she joined London rock station XFM, where she presented the weekday drivetime show until December 2003, and then in January 2004 took over a Friday evening music show for the station. She also stood in for Ricky Gervais while he filmed the second series of The Office. She left XFM at the end of 2004. In September 2007, she hosted a show with Sara Cox celebrating 40 years of BBC Radio 1. From 2006, she provided relief presenting duties for BBC Radio 2, fronted specialist documentaries, sat in for Dermot O'Leary for three weeks in February 2006, and co-presented (with Danny Baker) the hastily conceived replacement for Jonathan Ross' Saturday morning show, in the wake of Ross's suspension due to Sachsgate in 2008. In 2009, Ball became the usual relief presenter for Ken Bruce's weekday mid-morning show on BBC Radio 2. She also began hosting the Saturday breakfast show from 6:00 a.m. to 8:00 a.m. on the network from 6 June 2009 as part of a shake-up of weekend programming at Radio 2. Ball left the Saturday breakfast show on Radio 2; her last show was broadcast on Saturday 28 January 2012. Her replacement in that slot was Anneka Rice. Ball continued on Radio 2 as Ken Bruce's cover. Ball covered the BBC Radio 2 Breakfast Show for Chris Evans on several occasions. On 3 October 2018, she was announced by Chris Evans as the new host of The Radio 2 Breakfast Show, which began on 14 January 2019. Rylan Clark-Neal replaced Ball in the Saturday afternoon slot. The daughter of the children's TV presenter Johnny Ball and his wife Julia (née Anderson; the couple divorced when Zoë was two), Ball was educated at Heston Junior School in west London between 1975 and 1978. Her family then moved to Farnham Common in Buckinghamshire. She attended Farnham Common First School and Farnham Common Middle School before moving to Holy Cross Convent School in Chalfont St Peter and Amersham College of Art and Technology. Whilst at BBC Radio 1, Ball began a relationship with the DJ and musician Norman Cook (also known as Fatboy Slim). The couple married at Babington House in Somerset, in August 1999. In 2003, the couple split up when Ball revealed that she had had an affair with a close friend of Cook, fellow DJ Dan Peppe. Ball and Cook were later reconciled. The couple have a son, Woody (born 2000), and a daughter, Nelly (born 2010). They lived in a beachfront property in Western Esplanade, Hove. On 24 September 2016, the couple announced their separation after 18 years together. More recently, Ball was reported to have been in a relationship with BBC cameraman Billy Yates for several months. On 4 May 2017, Yates was found dead at his home in south London. It is understood that Yates died by suicide, and was depressed after falling victim to a financial scammer. In 2014, she supported Marks & Spencer and Oxfam’s Love Mum campaign. In March 2018, Ball took part in the 'Hardest Ride Home' challenge, which saw her cycling from Blackpool to Brighton to raise money for Sport Relief and mental health awareness. She set off on 5 March for five days. Highlights of the challenge were broadcast in a one-off documentary, airing on 21 March 2018 on BBC One. As a result of the challenge, she was able to raise a total of £1,198,012. 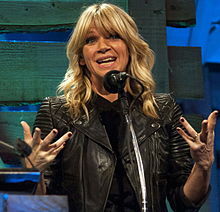 ^ a b "BBC - Zoe Ball to host the new BBC Radio 2 Breakfast Show - Media Centre". www.bbc.co.uk. Retrieved 2018-10-03. ^ Rachel Sixsmith & Carla Delaney (6 February 2006). "Zoe Ball: 'Holy Cross was like movies'". Bucks Free Press. Retrieved 6 October 2016. ^ a b c Mesure, Susie (6 October 2012). "Zoe Ball: 'I'm quite loved up at the moment'". The Independent. Retrieved 31 March 2018. ^ a b c Naughton, Pete (27 October 2009). "Zoe Ball: 'It'd be nice to get a lass on Radio 2 during the day'". The Telegraph. Retrieved 31 March 2018. ^ Sheppard, Ciara (18 May 2017). "Kid's TV presenters from the 90s & 00s: Where are they now?". glamourmagazine.co.uk. Retrieved 31 March 2018. ^ a b c Anderton, Joe (22 October 2016). "Zoe Ball is confirmed as the first host of the new series of Film 2016". digitalspy.com. Retrieved 31 March 2018. ^ "Cringe along with Frank". bbc.co.uk. 21 February 2002. Retrieved 31 March 2018. ^ "Strictly Dance Fever". ianvictoria.co.uk. Retrieved 31 March 2018. ^ "Extinct: The Quiz". ukgameshows.com. Retrieved 31 March 2018. ^ Bourne, Dianne (15 February 2007). "Soapstar Superstar: Tupele has a fan in Fatboy". Manchester Evening News. Retrieved 1 April 2018. ^ "Zoe, Holly and Sinitta start search for new Sandy and Danny". 29 March 2007. Retrieved 31 March 2018. ^ Saner, Emine (5 November 2009). "Question time: Zoë Ball". The Guardian. Retrieved 31 March 2018. ^ Jackson, Jasper (17 March 2016). "One Show's Alex Jones and Matt Baker swap places in nod to BBC Breakfast row". The Guardian. Retrieved 11 April 2018. ^ BBC News (1 August 2013). "BBC News - New Doctor Who star to be unveiled". British Broadcasting Corporation. Retrieved 4 August 2013. ^ "In pictures: Children in Need telethon". bbc.co.uk. 16 November 2013. Retrieved 31 March 2018. ^ a b c d Gregory, Kim (3 November 2014). "8 reasons why Strictly's Zoe Ball just gets more awesome with age". celebsnow.co.uk. Retrieved 31 March 2018. ^ Shenton, Zoe (20 February 2015). "EastEnders live: Creepy man lurking behind Zoe Ball prompts hilarious Twitter reaction". The Daily Mirror. Retrieved 31 March 2018. ^ "Darcey Bussell to front BBC's search for UK's best young dancer". The Guardian. UK. 14 January 2015. Retrieved 16 January 2015. ^ "10 things we learned during episode one of the new series of Don't Tell The Bride on BBC One". The Argus. 24 June 2015. Retrieved 31 March 2018. ^ "Zoe Ball to present new BBC game show". digitalspy.co.uk. 6 September 2015. ^ "Zoe Ball". bbc.co.uk. Retrieved 31 March 2018. ^ Jones, Paul (6 July 2011). "Strictly Ball-room: Zoë is the new It Takes Two host". Radio Times. Retrieved 31 March 2018. ^ "BBC pay: How much do its stars earn?". BBC News. 19 July 2017. Retrieved 2 August 2017. ^ "Zoe Ball and the 90s ladettes: Where are they now?". celebsnow.co.uk. 4 November 2014. Retrieved 31 March 2018. ^ "Radio report slams swearing". bbc.co.uk. 24 July 2000. Retrieved 31 March 2018. ^ "BBC Genome Project". Zoe Ball. Retrieved 6 January 2019. ^ Whitehead, Jennifer (21 August 2002). "Xfm promotes Zoe Ball's new show with London poster campaign". campaignlive.co.uk. Retrieved 1 April 2018. ^ Day, Julia (16 December 2003). "Ball quits Xfm drivetime slot". The Guardian. Retrieved 1 April 2018. ^ Plunkett, John (27 May 2009). "Zoe Ball to host Saturday early breakfast show on Radio 2". The Guardian. London. Retrieved 27 May 2009. ^ "BBC Radio 2 DJ Chris Evans loses voice on air". BBC News. Retrieved 11 April 2013. ^ "Zoe Ball thanks her fans in first radio show since the death of boyfriend Billy Yates". London Evening Standard. Retrieved 3 June 2017. ^ Sale, Jonathan (18 December 1997). "Education: Passed/Failed Zoe Ball". The Independent. Retrieved 6 October 2011. ^ "Zoe Ball admits to new love". BBC News. 28 January 2003. - "Zoe Ball regrets her 'mad period'". Daily Mail. London. 26 June 2006. ^ "BBC Presenter Ball is pregnant". BBC News. 11 July 2009. - "Zoë Ball, Cook 'welcome second daughter'". Digital Spy. Retrieved 15 January 2010. - "Zoe Ball launches subscription YouTube channel". The Argus. Retrieved 20 July 2014. ^ "TV's Zoe Ball and DJ Norman Cook announce separation". BBC News. 24 September 2016. ^ "Billy Yates, Zoe Ball's partner dies". The Guardian. 4 May 2017. Retrieved 6 May 2017. ^ "Zoe Ball's boyfriend fell victim to conman accountant before his death". 8 May 2017. Retrieved 10 May 2017. ^ MacMichael, Simon (26 February 2018). "DJs and TV stars Greg James and Zoe Ball get in the saddle for Sport Relief". road.cc. Retrieved 31 March 2018. ^ "Zoe's Hardest Road Home". 24 May 2018. Retrieved 4 October 2018. ^ "CBBC offers life-line to Gordon The Gopher as stars reunite to celebrate 30 years of live Children's BBC Presentation". www.bbc.co.uk. ^ Furness, Hannah (3 March 2017). "'I just don't sleep': Nadiya Hussain set for new family challenge ahead of Bake Off battle". The Daily Telegraph. Retrieved 4 March 2017.